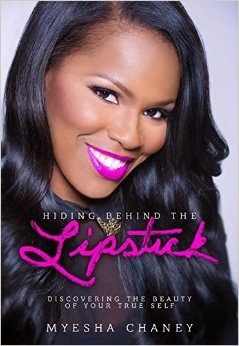 Today we are interviewing Myesha Chaney, author of Hiding Behind the Lipstick. To empower and inspire women to be who they are. Who do you think would most appreciate this book? Women from all walks of life between 18-50 years old. I was tired of pretending and wanted to live an authentic life. How long did you work on this book for? Since 2009 so about 5 years. There is so much pressure in society to be perfect and to fix our flaws. Even though that seems great, it causes the truth of who we are to be concealed. What was the most interesting thing you found while writing this book? There were so many stories I was able to draw from that really made writing the book emotional. In Hiding Behind the Lipstick, you write about how readers can liberate themselves from the pressures of society. How long did it take you uncover the various ways people can liberate themselves? Was it a process that has been going on since you were young or something that followed a defining moment? It took almost of year to uncover the various ways people can liberate themselves. My process began in my early twenties when I became a pastors wife. This was my defining moment when I could have just played a role versus truly living my authentic life and purpose. It will cause them to truly look inward and determine who they are at the core of their being. What needs to happen so that society will stop pressuring people to hide behind masks of superficiality? Have you friends and family been supportive of your writing? Absolutely, we all have been on this journey together. Are you active on social media? Why or why not? Yes, it is a great way to connect with people. I use it to encourage people who are searching in life. A book about being single, unmarried after thirty.